I love noodles in pretty much any shape or form. Whether they are Italian, Asian, or anything in between, they are at the forefront of my love and affection. 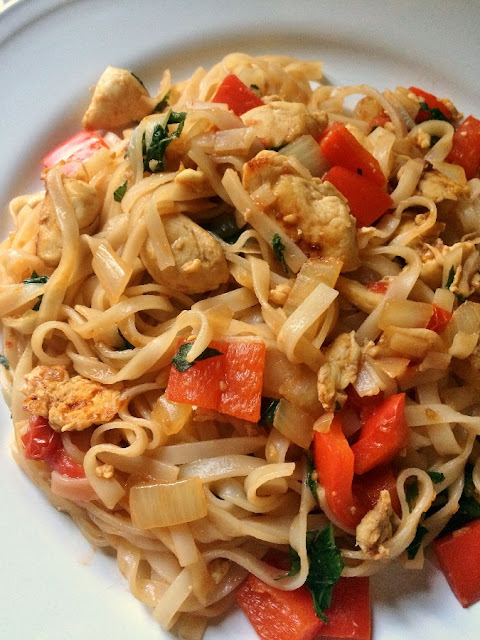 Pad Thai is one of my favorites, and I was recently exploring other stir-fried rice noodle dishes that I can make to change things up a little in my kitchen. 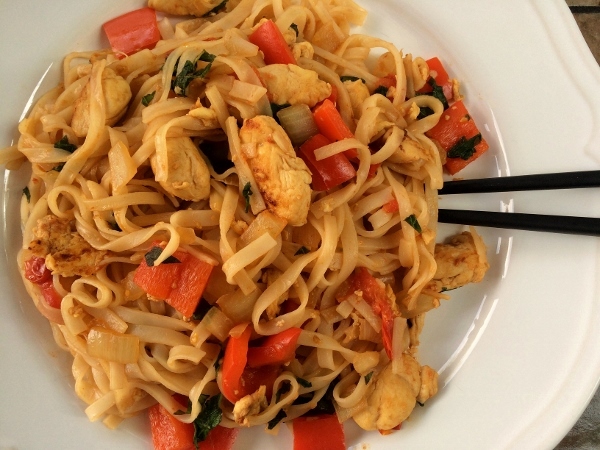 This particular recipe derives from Penny's Noodle Shop in Chicago. 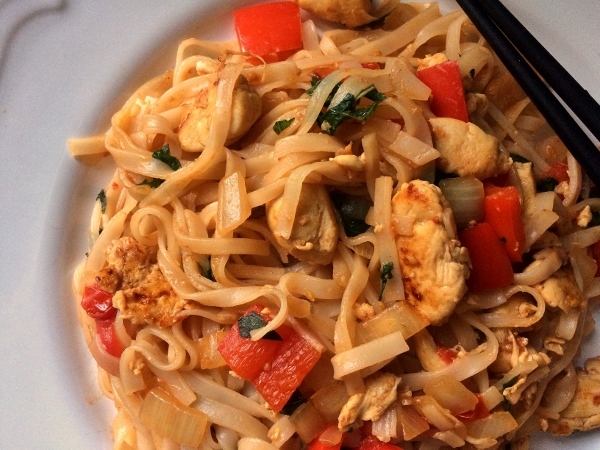 This Thai eatery serves all the classics as well as these spicy hot pepper noodles. They make theirs with super wide rice noodles (think pad see ew), but I used the medium width I had on hand. 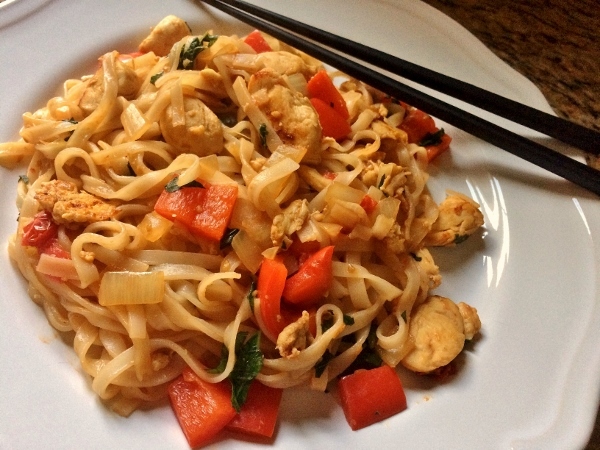 Since my Pad Thai recipes uses 6 ounces of rice noodles, and this recipe uses 10 ounces, you can make both of these dishes using a 1 pound package of noodles (perfect math!). 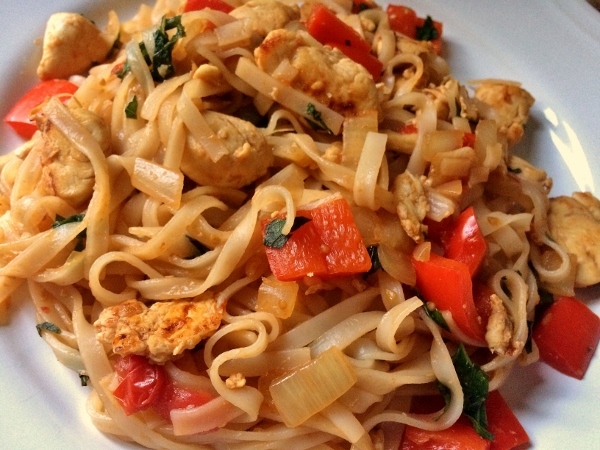 That's exactly what I did, using what was leftover after making Pad Thai weeks earlier to make this bright-flavored Thai noodle dish. I particularly love the accent of fresh basil and juicy tomatoes that really counteract the spice from the sauce. If you're looking for quick and satisfying Thai noodles, don't order take out. Look no further than this easy and colorful stir-fry, packed with protein from chicken breast and scrambled egg. You could also substitute an equivalent amount of thinly sliced beef for the chicken, or tofu if you'd like to keep if vegetarian (although beware that oyster sauce is not vegetarian if you go that route). Stir oyster sauce, chili-garlic sauce, soy sauce, and sugar in a small bowl to combine; set sauce aside. Cook noodles according to package directions. Drain, run under cold water to cool, snip a few times with kitchen shears, and set aside. Heat oil in a large wok or skillet over medium-high heat; add garlic and cook, stirring often, until fragrant, about 30 seconds. Add chicken and cook, tossing often, until cooked through, 3 to 4 minutes. Add pepper, onion, tomatoes, and 2 tablespoons reserved sauce to pan and toss to combine. Cook for a few more minutes until the vegetables start to soften. Push the chicken and vegetables to the side of the wok and add the egg to the open space. When it begins to cook, gently scramble the egg until it's no longer runny, then stir it to combine with the chicken mixture. Add noodles and remaining 2 tablespoons sauce and toss to combine. Add basil leaves and cook, tossing constantly, until noodles and vegetables are completely coated with sauce and heated through, about 2 minutes more. Serve immediately.